A complete, practical manual for growing plants indoors. 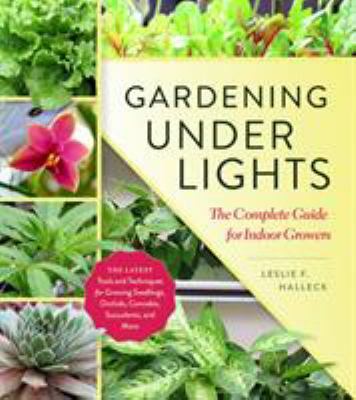 Gardening Under Lights details everything a gardener or hobbyist needs to know to garden indoors. Part One starts with the basics of photosynthesis, the science of light, and how to accurately measure how much light a plant needs. Part Two provides an overview of the most up-to-date tools and gear available. Parts Three and Four offer tips and techniques for growing popular ornamental plants (orchids, succulents, bonsai, and more) and edible plants (arugula, cannabis, oregano, tomatoes, and more) independent of the constraints of volatile outdoor conditions. Gardening Under Lights is a highly-detailed, accessible guide for seed starters, plant collectors, and anyone who wants to successfully garden indoors. AUTHOR: Leslie Halleck has a master's in horticulture from Michigan State University. She is a Certified Professional Horticulturist (CPH) via The American Society for Horticulture Science. Halleck launched Halleck Horticultural in 2000, an independent business that provides consulting services to green industry businesses. She has been published in Fine Gardening, Neil Sperry's Gardens, Edible Dallas & Fort Worth, and more.